Valley Road Speeder Wagons are Amish built with the finest hardwoods. The bright red, green, blue & pink side racks are stapled & glued for a strong bond. No-tilt auto-turn steering, ball-bearing wheels, & heavy steel framework make a strong wagon for pleasure, gardening, farming, or for the contractor. With proper care, these wagons will give you & your family years of enjoyment! 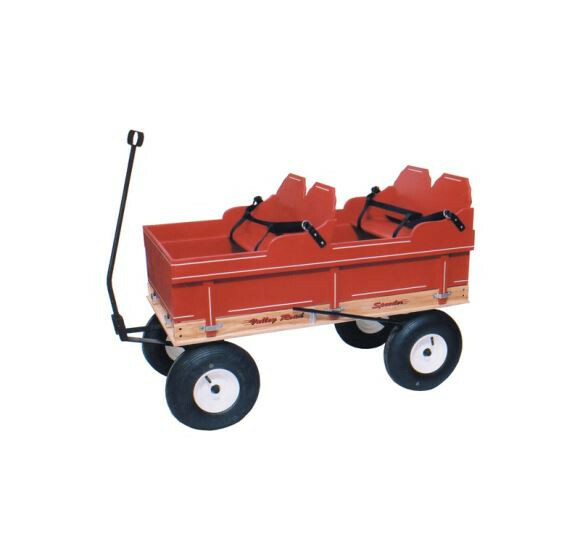 Valley Road makes a great double row bench seat for many of their wagon models. These stylish, heavy-duty seats are an example of a fine Amish craftsman. They are great for a stroll with your kids at the park, beach or in you own neighborhood! The seat drops in place after removing the side racks. You can choose to add seat belts which are 3-point contact and are made of nylon. Double bench seats are available for the following model numbers. Prices vary according to the size. Please make sure you measure you wagon's bed size before placing your order.